These personalized wishing well cards feature a nostalgic "Retro Rose " design printed with flat print technology on 80 lb. cover-stock. On one side of the card is a white card with a rose bud design at the bottom for the guests to write down their well wishes and advice for the happy couple. 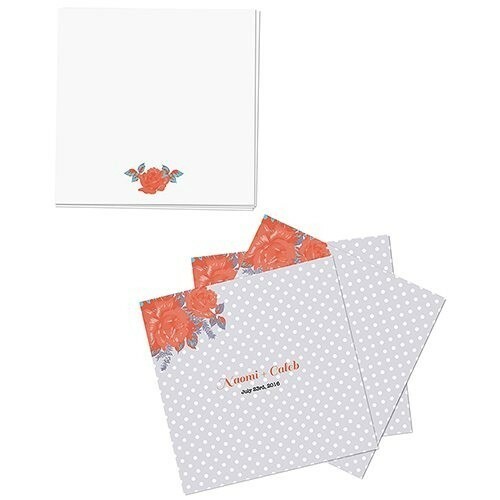 The other side of the card features a pastel blue and white polka dot motif with a bouquet of roses design in the upper left hand corner. This side of the card may be personalized with the couple's names (separated by & or "and") and the event date printed in the ink colors and the fonts shown only. PLEASE NOTE: Sold as a set of six (6) and prices quoted below are per set. Due to personalization, the minimum order quantity is four (4) sets.